In my class yesterday, I mentioned that I am a sucker for movies with animals. The trailer for Secretariat brings a tear to my eye. What kid didn’t want lassie to be their dog, or cry when Old Yeller or Thomasina died? Then someone asked me if I therefore liked Marmaduke. I have of course not seen that travesty, so thirty years from now I won’t have to be writing about what movies I saw in the old days and then be forced to mention it. 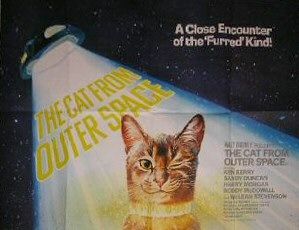 Unfortunately, that is not the case with “The Cat From Outer Space”. I saw it, I admit it, and I am embarrassed. Look, it’s not that it’s a Disney live action film. I still like the Ugly Dachshund and Herbie the Love Bug. The problem is that it is the dregs of the Disney live action films from the seventies. Elements of the story are recycled from other Disney movies, the actors are all encouraged to mug for the camera, and a premise that might be fun for kids is wasted. This was a year out from Star Wars and Close Encounters. It must have seemed like a brilliant idea to have a space themed kids movie for the summer. The idea of a visitor from another planet, hiding among the humans, who needs our help is not exactly original. My favorite Martian was a TV series that ran in the sixties. The Day the Earth Stood Still was big in the fifties. No one will ever think of this movie as a specimen of good science fiction or good kids movie. I am going to do some finger pointing here and it is not going to be pretty. My girlfriend made me take her to see this movie. I knew that it was not going to be any good. The Disney Studios of the late seventies had nearly run dry of creativity. They were functioning on the fumes of their past success. 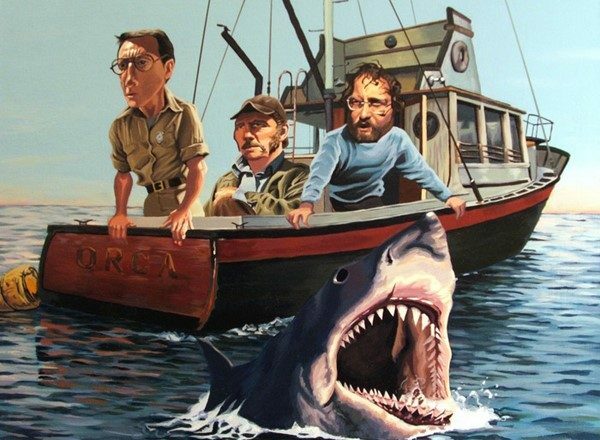 Most of the box office for their films came from re-releases of their classic animated films. The new animated films were passable but not great. It would be nearly a decade before the take over of Disney by other Hollywood insiders and Wall Street barons would restore the Disney brand to the status of Kingdom. The live action unit must have been a loss leader that they could take write downs on because the fantastic adventure films and clever family comedies of the sixties, gave way to stuff like this. This movie features some well know performers who deserved better. Sandy Duncan was the go to gal for Disney films in the seventies, and she is OK for what she is asked to do. McLean Stevenson and Harry Morgan were both on the TV series M*A*S*H, in fact, Morgan replaced Stevenson, so it is amusing that they co-star in this movie. I saw Harry Morgan in yesterday’s film “The Shootist” and he was a hundred times better. He is growling through this, in sleepwalk mode. The stuffed Cat they used for the flying sequence at the end did a better job than most of the actors. There is screaming and grimacing by the romantic leads, flustered glances from the supporting players and casual robotic appearances my some old timers like Hans Conreid and Jesse White. The writers lifted the plot from My Favorite Martian, complete with telekinetic powers, transplanted some evil secret organization elements and then grafted in a plot device that Disney had used for years. In Flubber, gamblers are making bets on basketball games, in Blackbeard’s Ghost, they have the football game to gamble on. If there is a story that requires quick fund raising, then they just stick in a gambling element and twist it to fit the story. Here it was completely unnecessary to the plot, but it allows some Extraterrestrial magic to be worked on a variety of games to amuse the kids. I just don’t think any of it was very amusing. The special effects look like they went out of date in the 1940s. 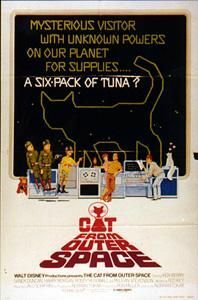 It may be that Spielberg saw this movie before he did E.T., because there is a scene where the alien (cat) makes a motorcycle fly briefly. If there had been a moon behind it someone could have sued. I told my students that my main criteria for rejecting a movie even when it has animals in it is, is based on whether the animals talk or dance. There are very few exceptions to that rule, but I think I should add one more element to the standard. If the animals have super powers then you should give it a pass also.